A global survey from British company, P2i, reveals that 43% of people have accidently damaged their mobile phones with water. Hardly surprising, given that “62% had never thought about water protection” and instead “relied on being extra careful,” says P2i Chief Technology Officer, Dr. Stephen Coulson. In addition, 70% said they use their phones in the rain, while 61% admitted to taking their phones in the bathroom. Heck, 12% even use their phones in the shower! Founded in 2004, P2i was initially tasked with commercializing liquid repellent technologies for the U.K. Ministry of Defense. The company locked down key patents and, in 2011, its technology was approved for British Army soldiers’ uniforms, providing protection against rainwater and dangerous liquid chemical weapons. But P2i didn’t stop there. Through strong innovation, the company’s “invisible surface solutions” now appear in a range of areas, making P2i a legitimate global leader in the field in just nine years. 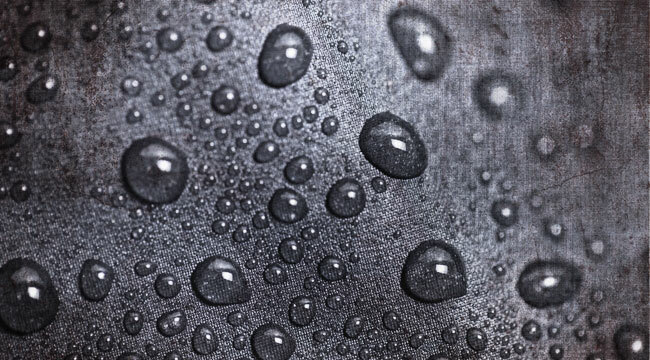 At the heart of P2i’s innovation is its patented, liquid repellent nano-coating technology. Don’t worry… we’re not going back to science class here. The way it works is actually quite simple. Essentially, the process involves coating a surface with a chemical polymer layer. It then forms an invisible shield that stops liquid from “bonding” on it. So instead of spreading out and absorbing into the item, the liquid breaks up and slides right off. As the name suggests, it defends against common splashes and spills. For example, if you spill a drink on your phone or tablet, or use an electronic device in the rain (or shower). 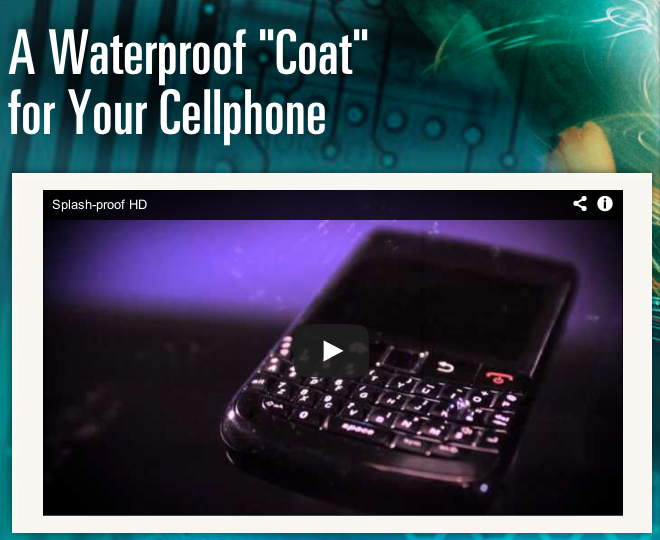 When the ultra-thin hydrophobic nano-coating is applied to the device, it repels liquid. And when I say this layer is “ultra-thin,” we’re talking just less than 50 nanometers wide. In layman’s terms, that’s an incredible 1,000 times thinner than a human hair, so devices look and feel exactly the same. But despite its size, the nano-coating is incredibly powerful. Since the polymer prevents absorbency, not only is the device protected on the outside, but ports and gaps are also sealed. That means the inside components and mechanisms stay unharmed, too. This isn’t some new technology that’s only being tested in a lab, either. On the contrary. Coulson says P2i is “working with all the top 10 mobile phone manufacturers” and its splash-proof technology is already used on 10 million Motorola mobile phones, as well as Alcatel (ALU) One Touch phones. It’s also in almost two-thirds of the world’s hearing aids, according to CNN. Now, splashes and spills are one thing. But what if you boost clumsiness to another level and drop your phone in the bath, toilet, or puddle? 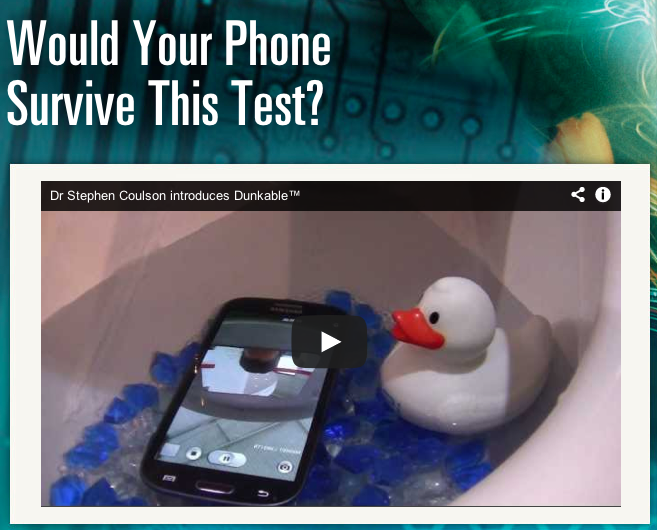 At the Mobile World Congress earlier this year, P2i introduced its “Dunkable” technology. We’re not talking about run-of-the-mill splash protection here. We’re talking full-on submersion. The technology features a denser hydrophobic coating that produces an IPx7 water rating. Translation: Phones are fully functional under one meter of water, for up to 30 minutes. Again, the nanotechnology is so thin and light, it’s unnoticeable and provides the ultimate barrier against water damage. Plus, manufacturers don’t need to modify anything in their design process, as the nano-coating treatment is added after the phones are built. Better yet, consumers don’t need to buy any additional water protection accessories. Like splash-proof, P2i believes the Dunkable technology is cost-effective and suitable for mass production. The company’s next step is to commercialize it. Having secured over 65 patents, P2i is able to further develop its technology and apply it to other areas. Indeed, the company’s ion-mask protective coating appears in clothes and shoes to repel water, dirt and stains, making the items more durable and longer-lasting. P2i’s impressive client list includes Nike, Adidas, Timberland and K-Swiss. Coulson believes P2i’s technology can treat anything that’s susceptible to water damage. And the company’s track record certainly suggests it can expand further, having received awards for the innovation and commercialization of its technologies, such as its nomination for “Best Mobile Technology Breakthrough” at this year’s Global Mobile Awards. Right now, P2i is still privately held. But turnover is doubling every year and hit $20 million in 2012, according to CNN. Clearly, this is a fast-growing company that’s well worth watching. Trump hasn’t been shy about squashing Sessions when he’s felt the need to do so. Today, Ray Blanco explains why billions in tax money and a million new jobs from the pot market could have Trump at odds with Sessions again.